Cheryl Mills, Clinton’s former chief of staff, along with two other State Department staffers, John Bentel and Heather Samuelson, were afforded immunity agreements, as was Bryan Pagliano, Clinton’s former IT aide, and Paul Combetta, an employee at Platte River networks, the firm hired to manage her server after she left the State Department. Combetta utilized the computer program “Bleachbit” to destroy Clinton’s records, despite an order from Congress to preserve them, and Samuelson also destroyed Clinton’s emails. Pagliano established the system that illegally transferred classified and top secret information to Clinton’s private server. Mills disclosed classified information to the Clinton’s family foundation in the process, breaking federal laws. None of these people should have been granted immunity if no charges were ultimately being brought, the source told Fox News. With no charges being brought, immunity only served to act as a cover for illicit actions. Immunity was also given to Mills and Samuelson for what was found on their computers, which were then destroyed as a part of negotiations with the FBI – something well outside the boundary of normalcy in a criminal investigation. Revealing the extremely disturbing favoritism shown by the FBI to Clinton, Mills was allowed to operate as Clinton’s attorney while a witness in the actual criminal investigation – something that should never have been allowed. “Mills was allowed to sit in on the interview of Clinton as her lawyer. That’s absurd. Someone who is supposedly cooperating against the target of an investigation [being] permitted to sit by the target as counsel violates any semblance of ethical responsibility,” the senior FBI official said. 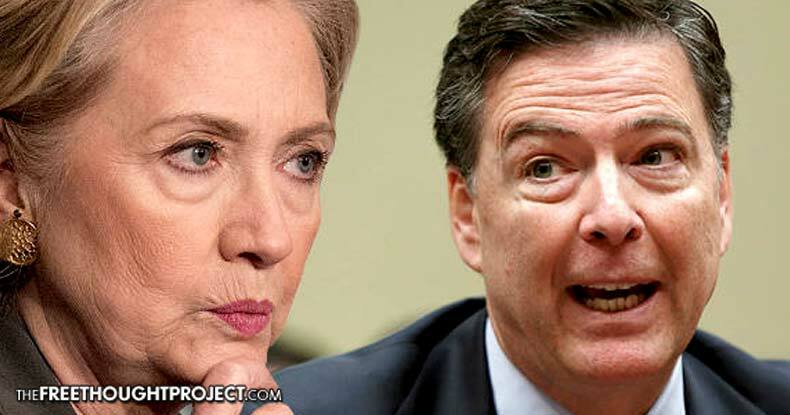 FBI agents were incensed with the fact that Clinton’s interview took just 3½ hours with no follow-up interview ever taking place, in spite of her “40 bouts of amnesia,” during the interview. Then, three days later, Comey cleared her of any criminal wrongdoing. The FBI source claims that the majority of FBI and DOJ staffers involved in the investigation believe Comey and Lynch were motivated not by justice, but out of personal ambition. Bolstering the contention that the entire FBI investigation was simply political theater meant to appease an angry public, WikiLeaks released internal Clinton communication records this week that revealed the U.S. Department of Justice kept the Clinton campaign updated to the progress of its investigation. “DOJ folks inform me there is a status hearing in this case this morning, so we could have a window into the judge’s thinking about this proposed production schedule as quickly as today,” Clinton press secretary Brian Fallon wrote regarding the email documentation the State Department would be required to turn over to the Justice Department. There is a painfully obvious truth in that the FBI itself has been co-opted as a tool to legitimize the oligarchy that rules. Instead of assigning responsibility for actions, the agency has shown itself to bend to the will of the political elite. If the FBI ever hopes to be a respected law enforcement entity again, they need a revolt from within to show the American public that they stand with them. Where are the brave FBI agents that are unafraid to go public with their feelings about the politicization of this case and the favoritism displayed to those with money, power, and political connections? Please share this story as a call to action in hopes that some fearless FBI agents will come together and finally take a stand for the American people!